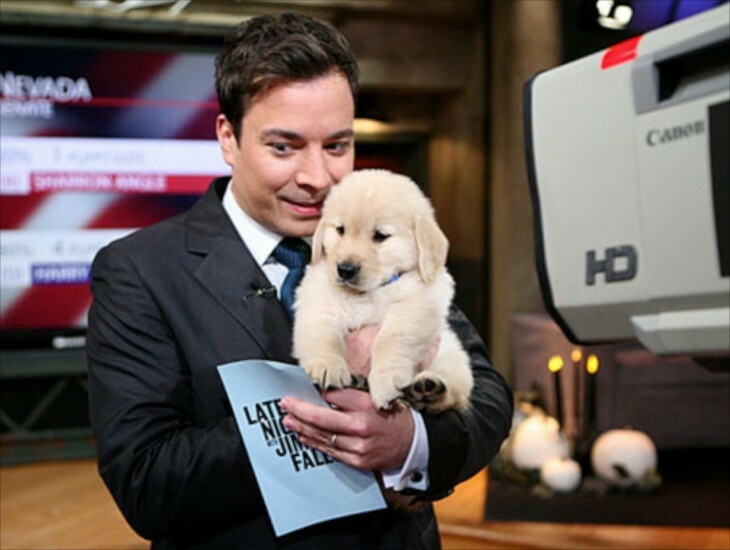 I miss Jay Lenno, but I also admit to being a big fan of Jimmy Fallon. Multi talented and quite funny, I enjoy his take as the new host of the Tonight Show. I searched and searched for more photos of his new farmhouse, but to no avail. None either on his NYC residence. 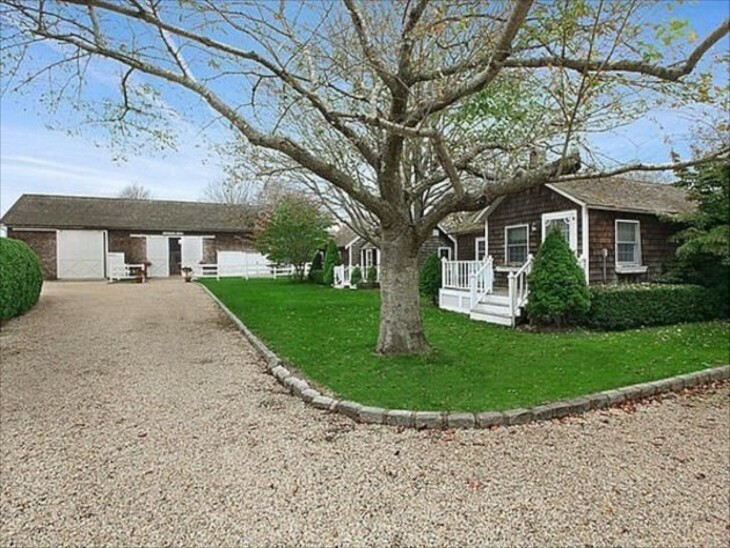 I think what impresses me, and contributes so much to his like ability is that he lives a pretty private personal life, and despite making millions before, and now $12 million/year for The Tonight Show, he chose a lovely former 1850’s former horse farm, modest by celebrity standards, beautiful and inviting instead of a mansion right on the water. When he and his beautiful wife Nancy Juvonen married in 2007, it was in a small quiet ceremony on Neckers Island, in the Caribbean, attended by immediate family and a few close friends. I couldn’t even find any photos except a few that Jimmy has shared on his show. How refreshing!!!! 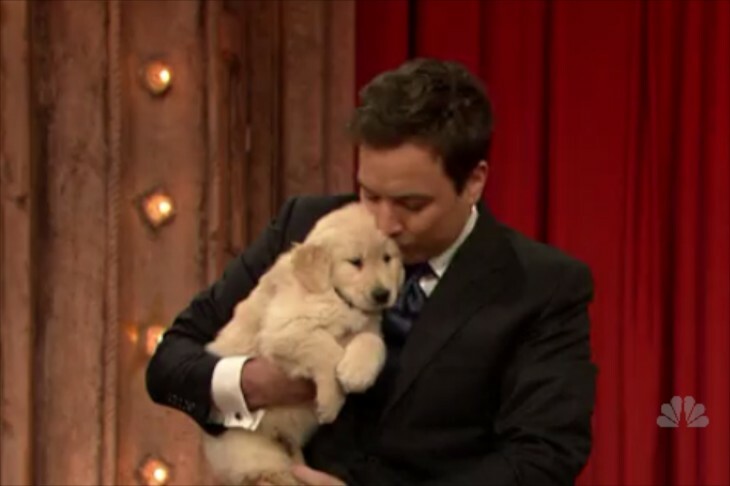 This is Jimmy in the fall of 2012 with his new Golden Retriever puppy Gary Frick. He adores her, and has her on the show every once in a while. 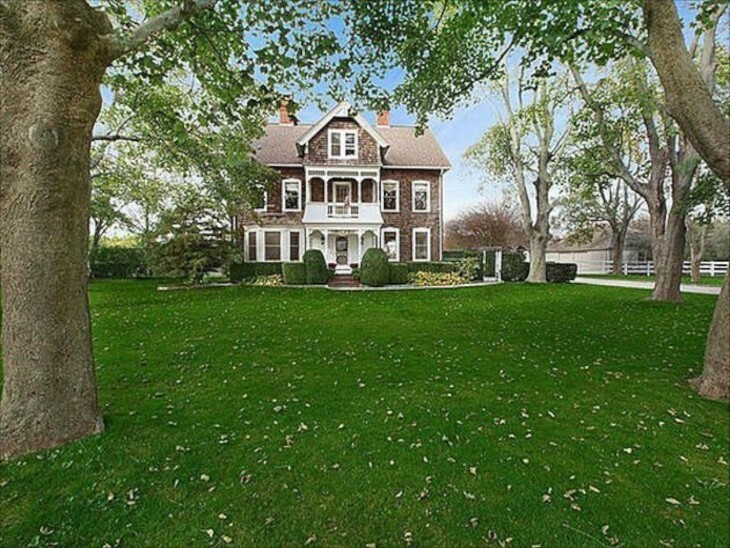 Built in 1850, the home was originally part of a large horse farm. The property now consists of 2.2 acres and includes 6 bedrooms, 5 full and 2 half baths in just 3500 square feet. There is an apple orchard and I think on one of these trees in the front would be a perfect place for a swing. 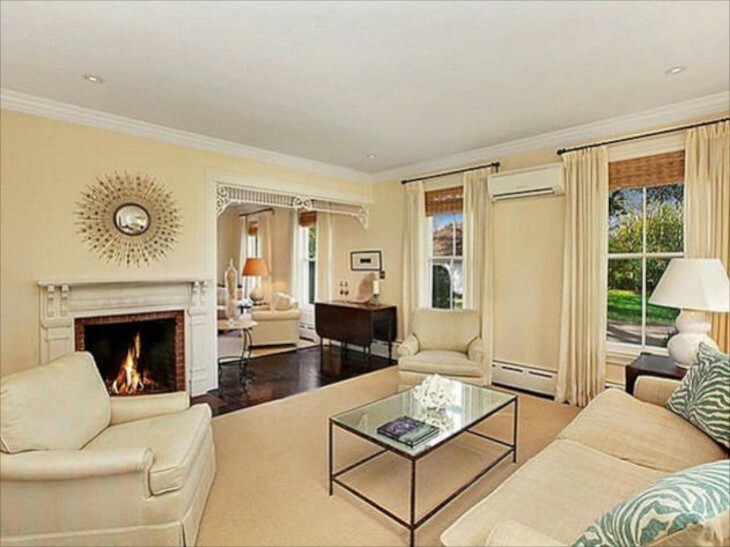 The Fallon’s purchased the home in June of 2011 and paid $5.7 million. 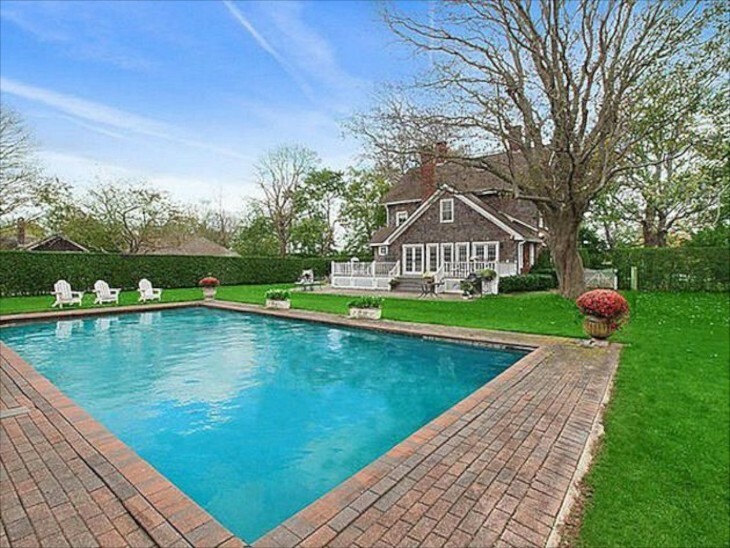 It is located in Sagaponack, in the Hamptons. The beach is about a mile away. 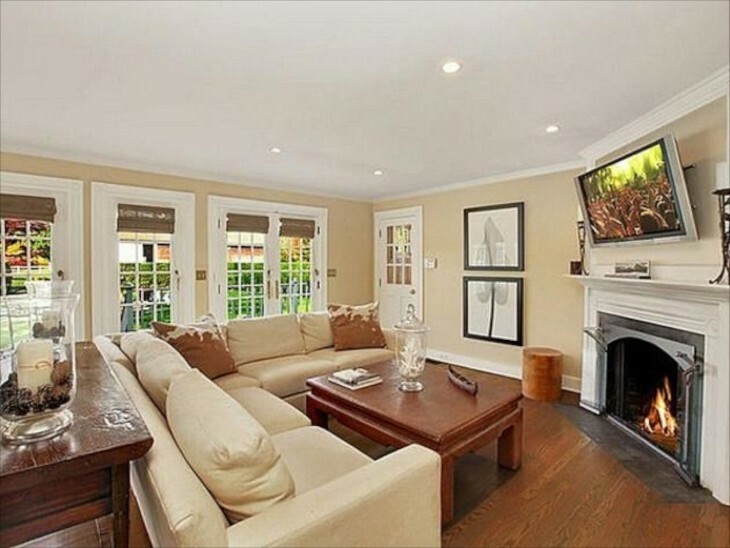 There are also several fireplaces in the home. 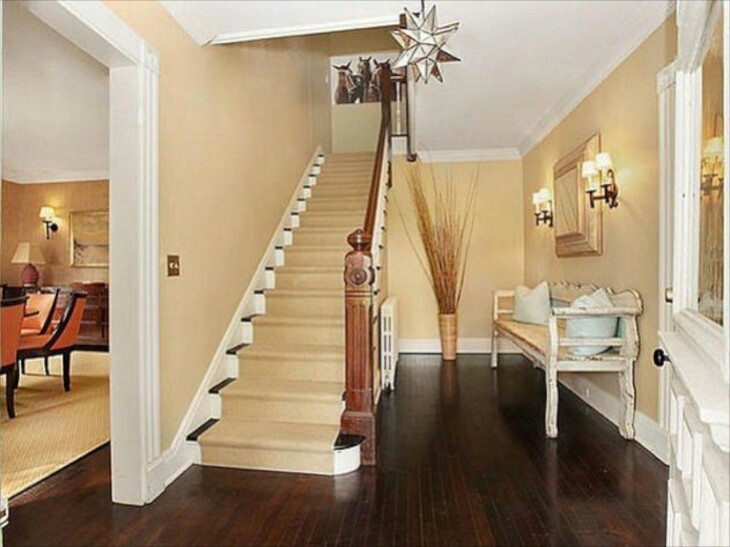 A soft chamois wall color and dark stains floors create a warm and inviting front entrance. Sisal runs up the stairs. You can see a glimpse of the dining room to the left. 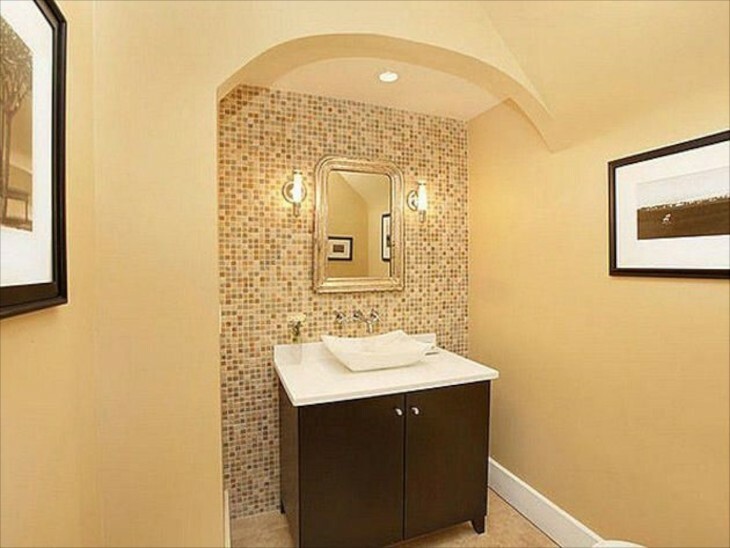 One of the half baths……. The family room. You can see the barn out the french doors. I like corner fireplaces, such as this one. Living room….the rooms feel large because of the color that runs throughout all the rooms and the monochromatic colors used in furnishings. Another fireplace warms the room. 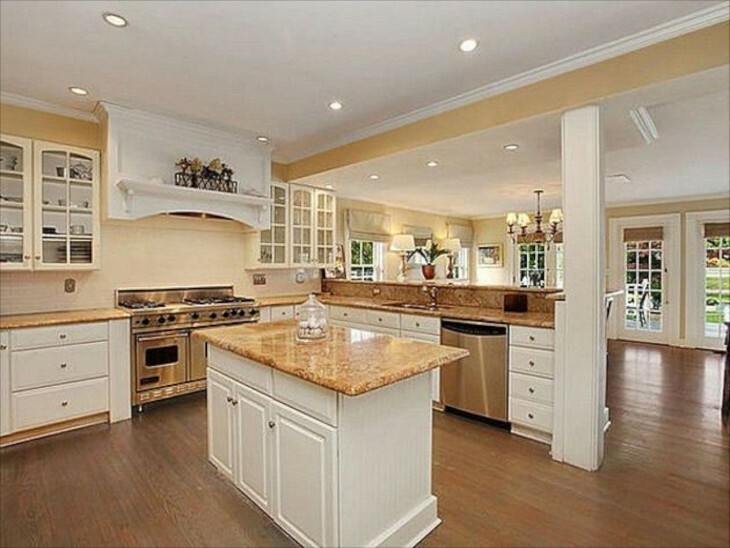 The kitchen is large, spacious, bright and functional. There are some changes I would make, but remember, this is a summer and vacation retreat. It appears that there is grasscloth on the walls of the dining room. Lots of windows really keep it bright. That is not always common in old farmhouses such as this. 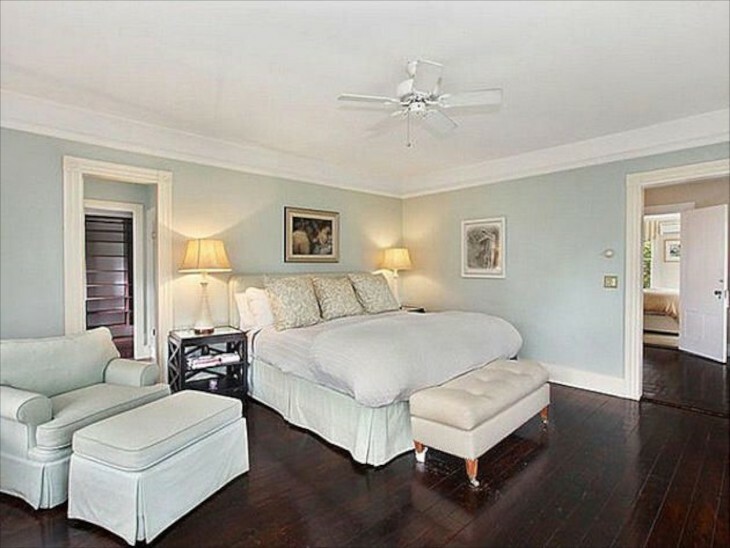 Soft silvery blue walls are perfect for a bedroom. I love the dark floors. You can see another bedroom across the hall. 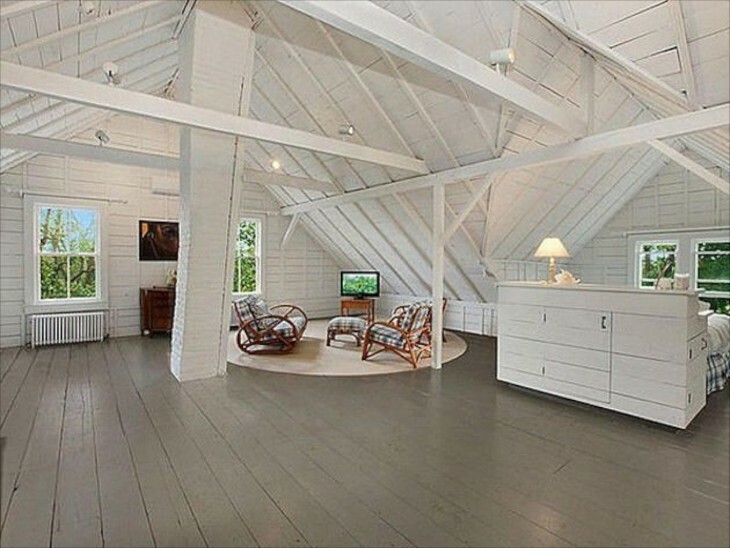 The attic is huge, and so interesting with the white painted exposed beams. I like how they floated the bed, and it faces the view out the windows. The barn and two guest houses and a simple river rock driveway. 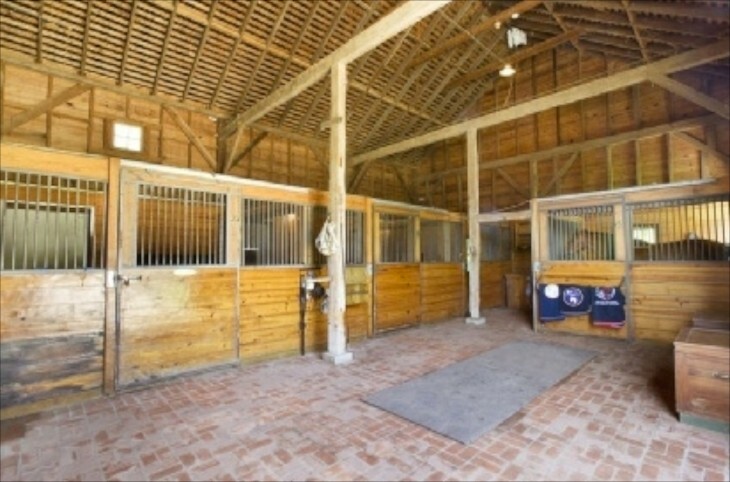 The inside of the barn. Love the brick floors. The pool is heated, and there is also a four car garage. Jimmie and his beautiful wife Nancy Juvonen Fallon. She is a producer, and they met at a party, and married in 2007. Jimmie and his female Golden Retriever “Gary Frick”. You can just tell that he would be a good father by the way he interacts with his dog. He got her in 2012. Jimmy with his wife, sharing an Eskimo kiss with their daughter Winnie Rose back in September 2013, while on a walk with the family and their dog in NYC. When he speaks about them, it is obvious he is crazy in love with his girls. They did not talk about it until after the baby was born, but they tried for a long time to have a baby, and their daughter was born via a surrogate, and is the joy they wanted and waited for for so long. Because Jimmy appears to be fairly private, I kinda felt a little uncomfortable looking for photos for the post! I don’t think he would mind what I have posted…..at least I hope not! He seems so genuine and comfortable in his own skin. I wish him and his family many continued blessings. For all you Downton Abbey fans, below is a Jimmy Fallon skit that is a satire of Downton Abby, called Downton Sixbey. Plot: He leaves his Tonight Show for the night and walks “into” his version of Downton Abby. Funny and smartly written. I am a big fan of the man !! Oh , what to say , that hasn’t been said before !! I watched LNJF , and it was ok . When Jay Leno left , I knew there would be big shoes to fill . So , so happy Lorne made the correct pick as to Jimmy Fallon !! On the particular show , when he announced his daughters birth , I fell in love with him !! Such compassion in a man , one rarely sees . He has had his ups & downs , but haven’t we all ?? Now , with two baby girls & beautiful wife , Jimmy needs a relaxing place to call his own . Happy he has found the right place ! Chicago would have been nice , but glad he choose the Hamptons !! Take care of him for his fans !! As much as I want to know & see more of Jimmy , I am glad he has privacy he can count on !! Thank you for the lovely home he was able to call his own !! Architecture as lifestyle choice. Adore when clients choose this. Jimmy’s stand-up jokes leave me questioning what is funny. Jimmy’s slapstick is a riot, love it. Jimmy seems the real deal, as does his wife, so I was not at all surprised that his home would reflect their integrity. When I design I stress living authentically…..and he seems to do this, and well. We loved Jay and definitely loved Johnny Carson! Such fond memories. Johnny, Jay and Jimmy, What a perfect trio! Check out that stove/oven in his kitchen. What is the name for that style again? I was curious to know the changes you would make to the kitchen, just for fun. I love the picture of the horses at the top of the staircase. I was laughing so hard at the Downton Sixby skit. Maggie Smith’s character was hilarious. They were all fantastic! But, I too would love to see his other homes. Not to be nosey, just to connect with the TV personality that we so admire. This was a beautiful tribute to Jimmy. The commercial range is a Viking I believe. In the kitchen I would add color to the backs of the upper cabinets. I would put “feet” under the base cabinets to make them look more like furniture, especially because they are white. I would add ceiling details both in the kitchen and in the adjoining eating area. I would add a chandelier or pendants over the island and maybe the breakfast bar area. Simple changes that can have a huge impact. Probably a few more tweaks, but those were what I immediately thought of when I first saw the photo. I just watched the skit again…..very funny. Maggie Smith just cracks me up in Downton Abby. Because of the Olympics I missed the last few episodes, so I have to play catch-up! Beautifully done! I loved everything about his home and I think your presentation was pure class. I love this, Charisse. So timely to have Jimmy Fallon and glimpses of his happy life. He seems so happy and deservedly so.